Irrational US policy is keeping hundreds of thousands of Cubans from spending the holidays with their families. There is an opportunity for President Barack Obama to begin rolling back our Cuba sanctions policy by finding a bank willing to do business with Cuba so that hundreds of thousands of Cubans can spend the holidays with their families. The main reason the Cuban Interests Section in Washington, DC, cannot process visas and passports is because no bank is willing to handle the financial transactions. The reason the banks are afraid is the US sanctions policy and Cuba’s listing on the global terrorism list. So the irrational US policy has come full circle: Obama’s policy of expanding and normalizing purposeful travel to Cuba is prevented by Obama’s embargo policies. It’s an opportunity to begin lifting the embargo, but chances are the administration is too timid, for now, to fully undo its own senseless policy. 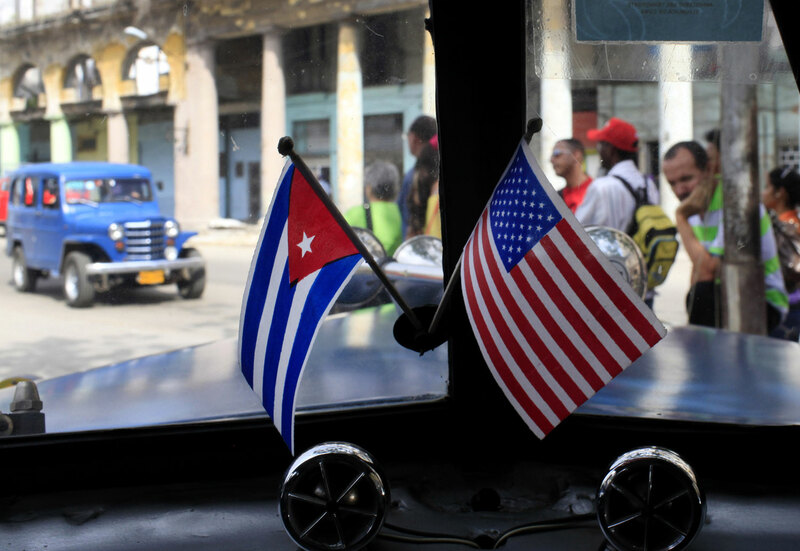 Each year, hundreds of thousands of Americans visit Havana, and hundreds of millions of dollars in trade and remittances flow from the United States to Cuba. We are committed to this human interchange, and in the United States we believe that our people are actually our best ambassadors. They are ambassadors of our ideals, of our values, of our beliefs. In terms of changing Cuban society, the most effective ambassadors are the Cubans coming back, somebody living on the corner bringing gadgets from Miami. When they are in their dining rooms they probably are not pretending to mislead. They will say work is harder in the US. They can bring some different element here, maybe in fashion or music. So you will get a mutual influence. I don’t really see a problem with that. They have been coming back for years. So? It’s a two-way influence. For Cubans, they get a broader view of Miami, and it challenges the mentality of those Cuban-Americans who think everyone from Cuba is a terrorist. What free travel permits is a better understanding of Cuba’s realities and some benefits for the visitors, like cheaper medicines for example. For decades we have had millions of tourists from Western Europe and Canada, and they haven’t changed the country, they just come to enjoy life and relax. Now we have Esteban Lazo as head of our National Assembly. He was a boy, a sugar cane cutter, in the Batista period. A little boy then; now he’s in his sixties. The misperception is that the Cuban system has been the same from the very first day; that the people who attacked Moncada are still around. Yes, a few are, but they are octogenarians. When Raul said he was getting out in five years, nobody here said, well, that’s the end. This irreversible process already has destroyed the argument of right-wing Cuban politicians, including Senator Marco Rubio and Representative Ileana Ros-Lehtinen, that no one should travel to Cuba, nor spend money in Cuba, because they would be subsidizing a dictatorship. Even many of Cuba’s US-supported dissidents have concluded that the blockade no longer makes sense. In a few years the Cuban government will be led by other persons with other last names. But I don’t think the [passing of the Castros] will create an immediate process towards normalization. The reasons and forces behind the current policy are strong than that. A new report says the US and Canada are failing asylum seekers. Jessica Weisberg breaks it down.